There are at least our big variables in the markets today. And with valuation levels where they are, pricing in perfection in so many ways, how likely is it, if you’re dealt four cards, that you’re holding four aces? It is less a matter of if risk asset markets will correct sharply than when and what will be blamed at the time. With regard to growth, bears point to an economic slowdown in the first quarter (most projections are around 2% or less). This is consistent with the dismal average of 2.1% growth since the end of the last recession in June 2009. Trade wars are another conundrum. There is little doubt that a true trade war will reduce global growth. Geopolitics are another on-again, off-again market driver. A strong case can be made for a coming war with North Korea. The final factor that is confounding markets is the potential for regulation of technology. There will certainly be congressional hearings on these matters and probably some legislation. Will Silicon Valley lobbyists dilute the legislation? Will antitrust allegations go up in smoke? Or will populist outrage with the tech giants lead to a sea change and aggressive enforcement as we saw with the Rockefeller trusts in the early 1990s? 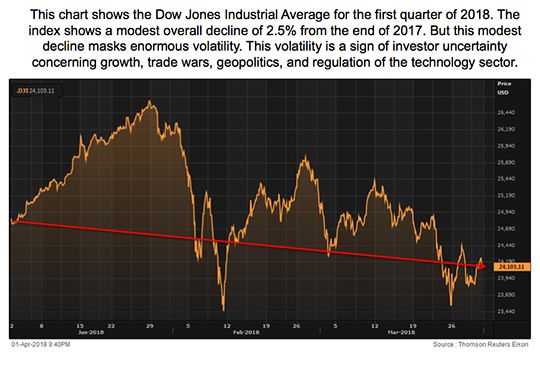 If growth is weak, trade wars escalate, North Korea is dealing in bad faith and popular outrage hamstrings the tech giants, then Dow 20,000 is in the cards. Of course, other combinations of these factors could emerge. Mixed results are entirely possible; that’s where the 16-path decision tree comes in. My estimate is that the less optimistic, more bearish path is most likely. But it’s unwise to put a stake in the ground on any particular outcome. The best approach is to assess incoming data in relation to the bearish hypothesis and update accordingly. It’s a time to be nimble.